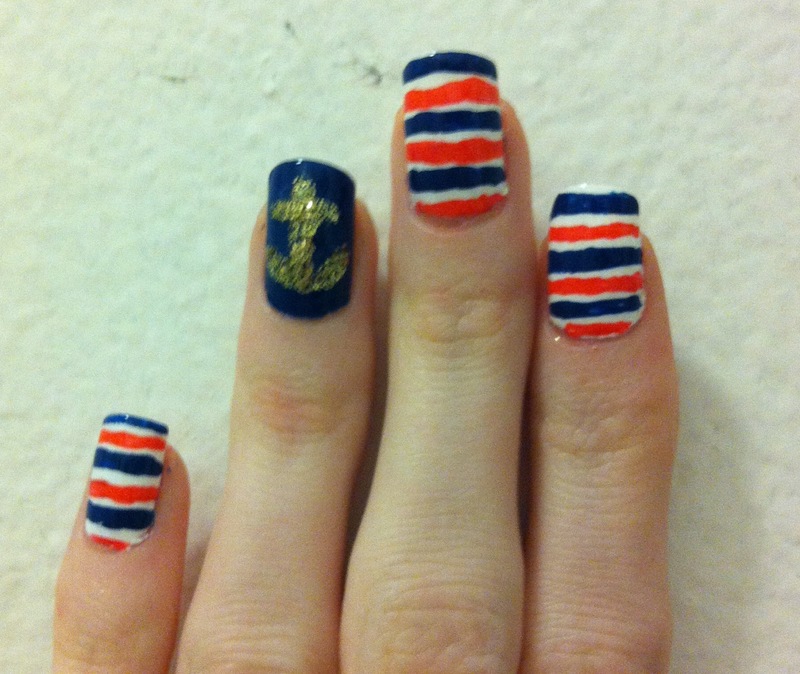 I am a huge fan of anything nautical-related. 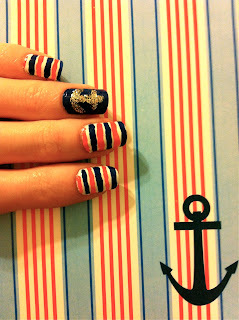 I have nautical-inspired jewelry, purses, shirts, stationary, even a tattoo! This nail art was a vision I had for awhile now, just wasn't too sure if I had the tools or ability to execute it. I decided to finally go for it & I am loving my nails! If you find yourself inspired too, keep reading for a how-to. Eyeliner Brush gets an Upcycle! 1. 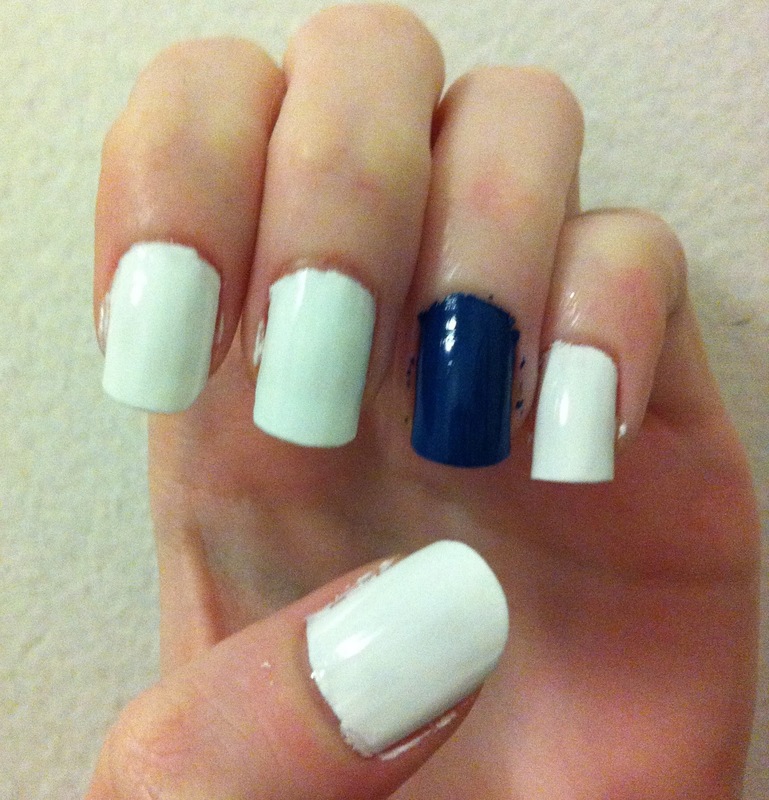 Paint your ring finger Navy (this will be your accent nail) and the rest of your nails white. I used 2 coats for each. 2. Next, place some navy polish on your piece of cardboard. Dip your brush in the blue & paint horizontal stripes along your white nails (leave the navy nail alone for now.) Leave enough room for a stripe in between. 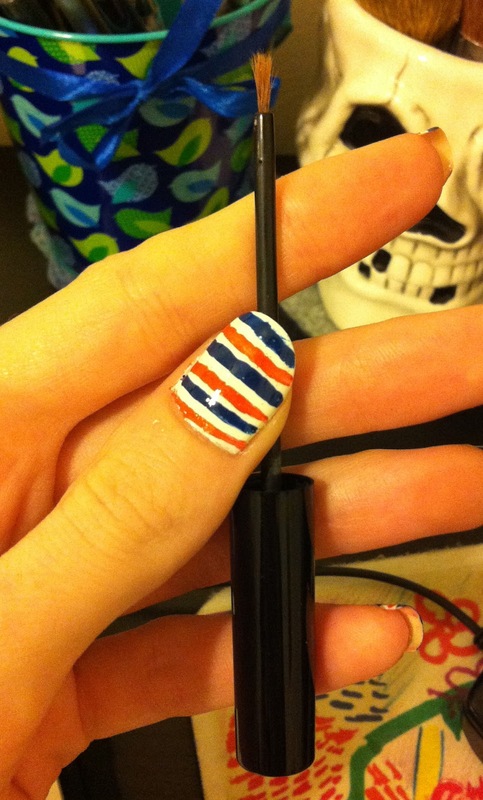 I ended up having three stripes per nail. Sorry for the yellow tint, I was painting my nails at my desk. 3. Repeat step 2 with the red polish. 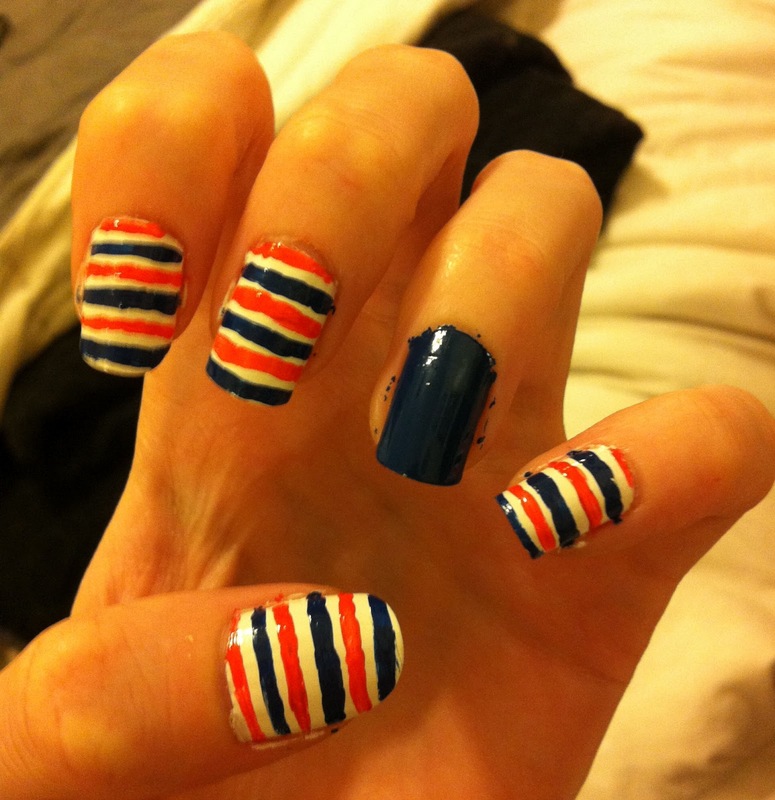 I ended up having 3 red stripes per nail too. 4. To finish the accent nail, I painted an anchor on using my gold polish. I created the anchor using three lines. 1. Paint a straight, vertical line in the middle of your nail. 3. Paint a short line horizontally that intersects your vertical line. 5. 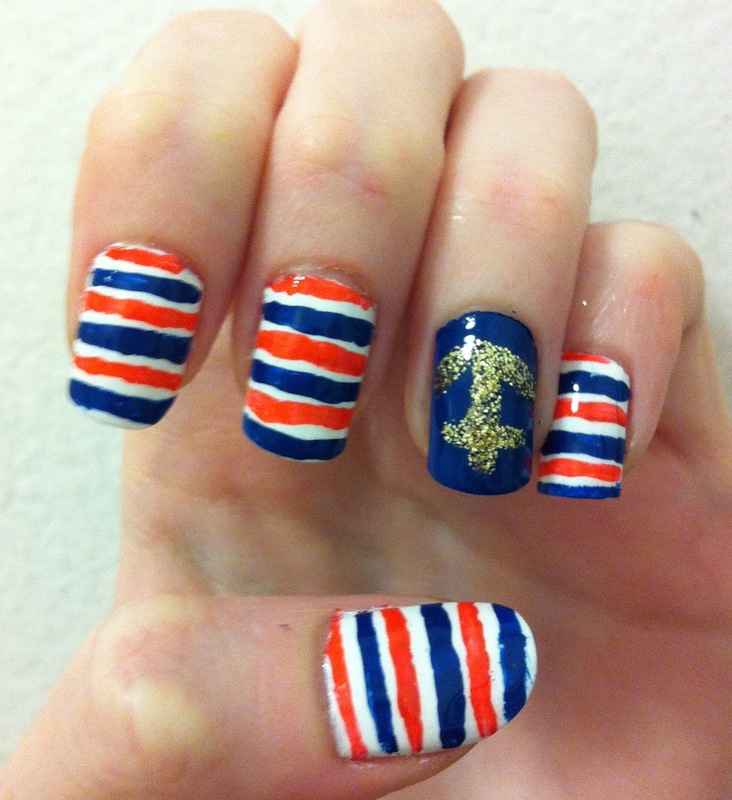 Wait for your nails to dry, then add your top coat! There are so many different variations you could do with this manicure. I like the look of the painted-on stripe for this design, but if you wanted more crisp lines, you could use striping tape. 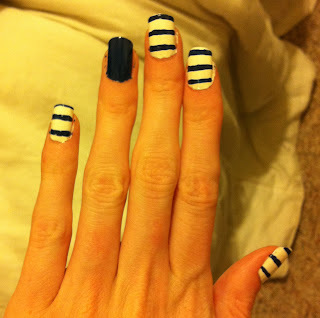 You could also paint all the stripes navy or all of them red. You could do different sized lines, different colours, anything! 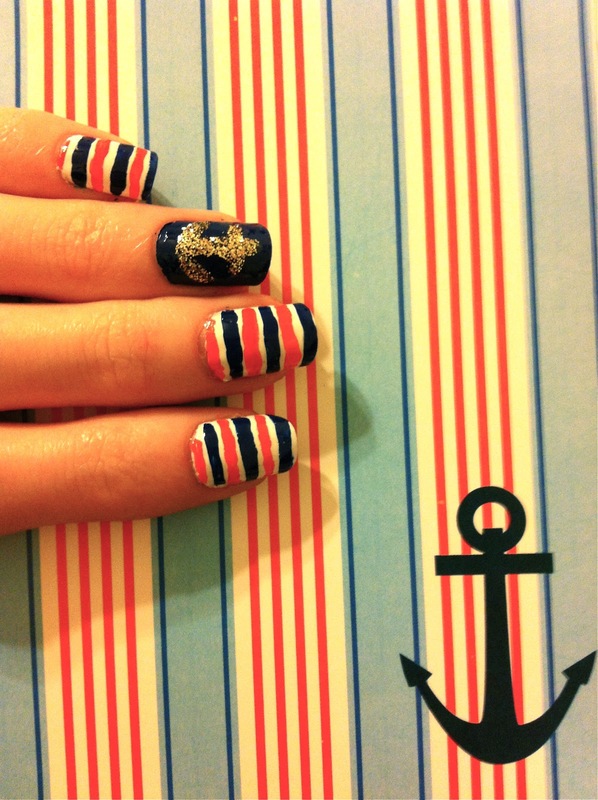 Don't be afraid to free-hand your nail art! Just reduce whatever shape you want to create into simple parts, and you'll have unique, easy nail art.